Escuela Verde, a public charter school in the Baran Park neighborhood, is planning to move to a new location in Silver City near the Menomonee Valley Passage to make room for more students. Seventy students are enrolled at the current location; the new building would accommodate 100 students. 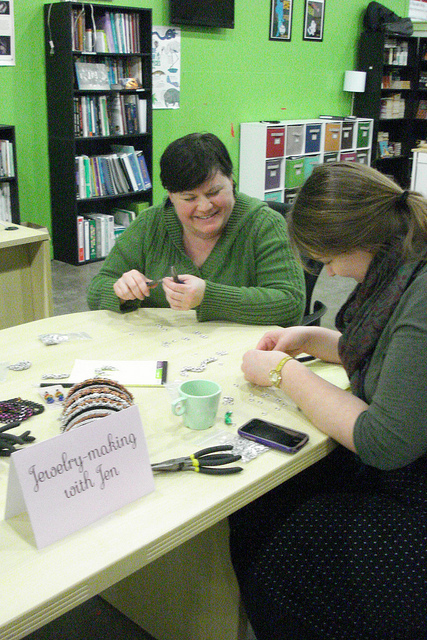 The school, at 126 E. Mineral St., hosted a do-it-yourself craft workshop recently to demonstrate the type of learning that takes place there. About 25 students and community members attended the event. Although it was open to Silver City residents, few attended. Will Sebern, community outreach manager for Layton Boulevard West Neighbors, said the group is planning more targeted meetings in the Silver City neighborhood itself. “I would expect better attendance there,” he said. Escuela Verde resembles a coffee shop more than a school, with its open space and welcoming environment. Students from grades seven through 12 share a teacher, who is called an advisor. Students set their own learning goals and learn by developing, researching and producing projects. To get one credit, students must log 100 hours of work on a project. Chemistry class may take the form of a soap-making seminar while a composition class might entail grant writing. Wellness can include topics ranging from female empowerment to martial arts. “We try to encourage students to do real-world work,” said Kim Theisen, an advisor at Escuela Verde. Seventh-grader Diya Noble was homeschooled until she took a tour of Escuela Verde and “saw all of the students having fun.” Her most recent projects investigated feminism and how colors affect emotions. At the workshop, advisors and community members led sessions on aromatherapy, healthy salad dressings and jewelry-making, to name a few. The projects mirrored the school’s emphasis on sustainability and the environment. 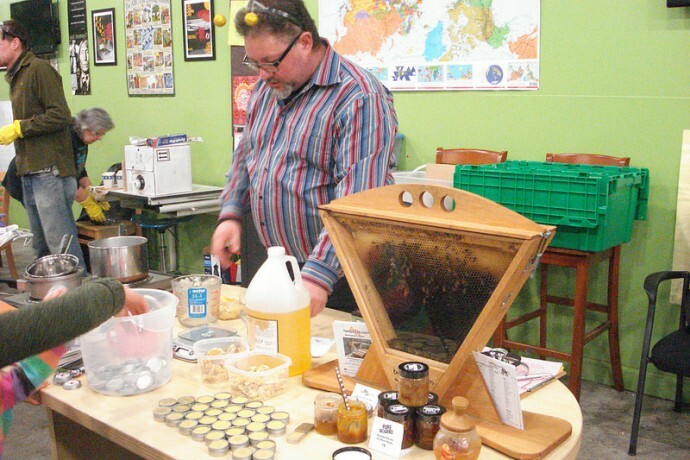 Riverwest resident Charlie Koenen showed participants how to make their own lip balm, using beeswax from his Beepods. He invented the Beepod, a V-shaped horizontal beehive that is closer to bees’ natural environment. Koenen set up a Beepod at Escuela Verde earlier this year and taught students the importance of bees in agriculture. “It’s funny how we’ve been relegated to think we have to go to the store for Chapstick when making it is so simple,” Koenen said. Chris Parr, a former principal at a small progressive school, praised the Escuela Verde’s mission of self-sufficiency. The event served two purposes, according to Madisen Stoler, community outreach coordinator for Escuela Verde. “We wanted to bring people into the school that haven’t been here before; (and) get them learning, just like the kids,” Stoler explained. It also was a fundraiser to help relocate the school. Stoler said the new school in Silver City would have multiple floors, more quiet spaces and access to outdoor resources such as the Urban Ecology Center. The school put in an offer to purchase the building, which is zoned as “heavy industrial.” Stoler and other advisors remain optimistic the property will be rezoned, and the new school building will open by next fall. A community input session for Silver City neighbors will be held on March 11 at the Urban Ecology Center in Menomonee Valley.